There is always some degree of thrust bearing misalignment due to housing and bearing machining tolerances, or misalignment between the shaft and housing. This is considered static misalignment since the bearing is misaligned before a load is applied. This static misalignment is different from dynamic misalignment that may occur when thermal expansion and mechanical deflection causes shifts in the housing and shaft position while in operation. For this example, the equalizing bearing has a spherical thrust shoe support and is a leveling plate or rocker type design as shown in Figure 1. This static misalignment condition is based on the assumptions that the collar (or thrust disc) is perpendicular to the shaft, the collar surface is flat and smooth, and the runout is within an acceptable tolerance. 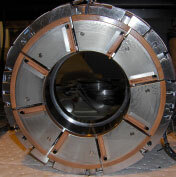 An equalizing thrust bearing distributes the load more evenly among the pads compared to a non-equalizing bearing. When a load is applied, the thrust pad pushes against the upper leveling plate. This forces the lower leveling plates on either side to tilt slightly and raise the pads on the other side. This reaction occurs on every pad and equalizes the thrust load. Capacity is greatly improved over non-equalizing bearings although the system is not perfect. There are physical limitations such as loss of leverage due to shifts in pivot contacts as shown in Figure 2. This results in a pad load differential that increases with alignment and depends on the bearing geometry, contact radii, and the number of shoes. A static test was performed to determine the load distribution on each pad for a 254mm (10 inch) diameter bearing shown in Figure 3. A thrust load of 1.93 MPa was applied and the bearing was misaligned 0.13° simultaneously. Figure 4 shows the load measured on each pad in Newtons (N) and the horizontal line is the average load per pad (6450N). 9650N was measured on pad 3, the heaviest loaded pad. This equates to a bearing unit load of 2.93MPa. Figure 5 compares the pad temperatures across a speed range for the normal load of 1.93MPa to the misaligned load of 2.93MPa. These temperatures are based on using ISO VG 32 oil at 50°C inlet temperature. The differences in pad temperatures range from 8°C to 12°C. From Figure 5 in the previous Newsletter, the maximum misalignment for a non-equalizing thrust bearing is less than 0.05° across the same speed range and similar unit load. The conclusion is an equalizing thrust bearing using leveling plates does an admirable job equalizing the thrust load. The 0.13° misalignment is typically much more than what is acceptable for industrial applications. Even with this high degree of misalignment, the hottest pad is still within a safe temperature range for continuous operation. Prepared By: David Casper, Engineering Service Coordinator at Kingsbury, Inc.